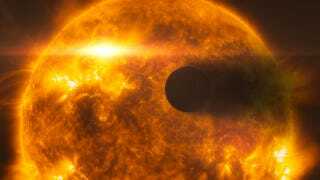 Top image: An artistic impression of HD 189733b, an exoplanet whose atmosphere is being blown off by its sun's solar flares. It's a discovery that was made possible by the emerging field of exo-meteorology. Source: Hubble Space Telescope. This is a freaky one — but then again, anything with the word "quantum" in it is bound to be weird. Physicists have known about quantum effects for well over a hundred years, where particles defy our sensibilities by disappearing from one place and reappearing in other, or by being in two places at once. But these effects are not relegated to arcane lab experiments. As scientists are increasingly suspecting, quantum mechanics may also apply to biological processes. Perhaps the best example is photosynthesis — a remarkably efficient system in which plants (and some bacteria) build the molecules they need by using energy from sunlight. It turns out that photosynthesis may in fact rely on the "superposition" phenomenon, where little packets of energy explore all possible paths, and then settle on the most efficient one. It's also possible that avian navigation, DNA mutations (via quantum tunnelling), and even our sense of smell, relies on quantum effects. Though it's a highly speculative and controversial field, its practitioners look to the day when insights gleaned may result in new drugs and biomimetic systems (with biomemetics being another emergent scientific field, where biological systems and structures are used to create new materials and machines). Image: qubit-ulm.com. Like exo-oceanographers and exo-geologists, exo-meteorologists are interested in studying natural processes which occur on planets other than Earth. Now that astronomers are able to peer more closely into the inner-workings of nearby planets and moons, they're increasingly able to track atmospheric conditions and weather patterns. Jupiter and Saturn, with their impossibly large weather systems, are prime candidates for study. So is Mars, with it's regularly occurring dust storms. Even planets outside our solar system are being studied by exo-meteorologists. And interestingly, exo-meteorologists may eventually find signs of extraterrestrial life on an exoplanet by detecting organic signatures in atmospheres, or elevated carbon dioxide levels — a possible sign of an industrial-age civilization. Coined by the University of Connecticut's Peter Turchin, cliodynamics is an interdisciplinary area of research that combines historical macrosociology, economic history (cliometrics), the mathematical modeling of long-term social processes, and the building and analysis of historical databases. It's basically Asimov's psychohistory come to life. The name is a portmanteau of Clio, the muse of history, and dynamics, the study of changes over time. Simply put, it's an effort to quantify and describe the broad social forces of history, both to study the past, and as a potential way to predict the future. An example of cliodynamics was Turchin's recent paper forecasting social unrest. Can “cliodynamics” help historians predict future unrest? This is the big one, and it's the emerging world-changing scientific discipline that many of us are already familiar with. Synthetic biology is the design and construction of new biological parts, devices and systems. It also involves the redesign of existing biological systems for any number of useful purposes. Craig Venter, a leader in this field, shook the biology community in 2008 by announcing that he had manufactured the entire genome of a bacterium by piecing together its chemical components. Two years later his team created "synthetic life" — DNA created digitally, and then printed and inserted into a living bacterium. And last year, synbio scientists created the first complete computational model of an actual organism. Looking ahead, synthetic biologists will sequence and analyze genomes to create custom-designed bootable organisms and biological robots that can produce chemicals from scratch, like biofuels. There's also the potential for pollution devouring cyborg bacteria, and the downloading and printing of recently updated vaccines during a pandemic. The possibilities are almost endless. Similar to cliodynamics, computational social science is the rigorous investigation of social phenomenon and trends over time. The use of computers and related information processing technologies is central to this discipline. Quite obviously, this field has only really been possible since the advent of computing, and most especially since the rise of the internet. Computational social scientists study the copious amounts of information left behind from emails, mobile phone calls, tweets, credit card purchases, Google searches, and on and on. It's a field of study that's attracting not just social scientists, but mathematicians and computer scientists as well. Examples of their work include studies into the structure of social networks and how information spreads across them, or how intimate relationships form on the Web. Image: Nature. Cognitive economics (or finance)...looks at what is actually going on within the individual's mind when they make that choice. What is the internal structure of their decision-making, what are the influences on it, how does information enter the mind and how is it processed, what form do preferences take internally, and then ultimately how are all those processes expressed in our behaviour? Normally, electronics are associated with inert and inorganic conductors and semiconductors, like copper and silicon. But a new branch of electronics is emerging that uses conductive polymers and conductive small molecules — both of which are carbon-based. It's a highly interdisciplinary field that involves the design, synthesis, and processing of functional organic and inorganic materials, along with the development of advanced micro- and nanofabrication techniques and circuit design. To be fair, it's not an entirely new field, as preliminary concepts and devices were first developed in the early 1970s. But it has only been recently that things have picked up, particularly on account of the nanotechnology revolution. Organic electronics introduces the potential for organic solar cells, self-assembling monolayers in functional electronic devices, and chemical circuits that could replace computer chips for human implantation (the cyborg of the future may very well be more organic than synthetic!). Image: AlphaGalileo Foundation. With the advances in biological instrumentation and techniques, and easy access to computing power, biology is generating large amounts of data at an increasing speed. Acquiring the data and making sense of it increasingly requires quantitative approaches. At the same time, coming from a physicist's or mathematician's point of view, biology has reached a state of maturity where theoretical models of biological mechanisms can be tested experimentally. This has led to the development of the broad field of quantitative biology. Scientists working in this field analyze and measure everything from the molecular scale right through to the organismal and ecosystem level. Image: AAAS. Please add any ones I missed to comments!